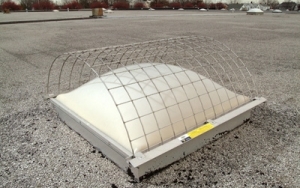 Kee Safety has developed a skylight screen to exceed OSHA standards, (i.e. screen will withstand a load of at least 200 pounds applied perpendicularly at any one area on the screen.) 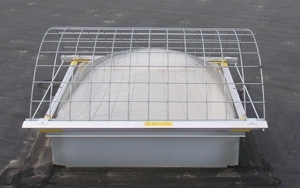 The unique construction and mounting design allow the KeeGuard Skylight Screen to be attached without penetration of the roof or the skylight, maintaining the integrity of the roof and the skylight to further satisfy 1910.23(e)(8). "Protecting the skylight must not cause the skylight to break" . Click HERE to read all OSHA standards regarding skylight safety. Cal-OSHA requires a stricter 400 lb. loading requirement in which case Kee Safety have suitable models available, click HERE to read more about the Cal-OSHA requirements.